I reviewed the Permian extinction a bit on Wikipedia (consulted September 28, 2011). It is called the Great Dying and happened about a quarter of a billion years ago. It was worse than the Spanish flu. (I regard that name as a complement to Spain. That was the only country where the authorities did not panic and suppress news of this most terrible plague, with the result of increased deaths in the absence of facts allowing prudent precautions.) It was preceded by an eruption at the Siberian Traps that was in turn the biggest eruption known, a lava flow three times the size of Texas. 96% of marine species and 70% of terrestrial vertebrates died. Coal vanished. There was the only known mass extinction of insects. For more gruesome details look at Wikipedia under Permian-Triassic extinction event. There was a rise of CO2 of about 2,000 parts per million, compared with the rise in CO2 since the Industrial Revolution of 103 parts per million. So where did all the CO2 come from? Even the mighty Siberian Traps seemed inadequate, since they were active over a very long time. There now seems to be an answer. (Paul B Wignall Lethal Volcanism NATURE vol. 477 no. 7364 September 15, 2011 page 285 and Stephen V. Sobolev Linking Mantle Plumes, Large Igneous Provinces and Environmental Catastrophes same issue page 312. The weight of the evidence is that the Siberian Traps came up through old seabed. Presumably organic matter with its carbon is more rapidly returned to the biosphere if its on the land rather than deep in the ocean, so an eruption through old ocean floor would bring to the surface more carbon. Of course I have the odd sense that I want to say, “Aha, but my catastrophe is worse than yours. As humans overpopulate, begin to die out and are left without a technology that can feed what is left of us, we are going to match that Permian stuff.” Idle boast. There won’t be anybody to add it all up. I think it’s safe to say that our current problems aren’t going to be compounded by an encore of the Siberian Traps. But climate trouble is brewing. It’s getting warmer. Even though we have had a brief respite in recent years, corresponding roughly with our appreciation of the fact that there just might be a problem, I am a believer in warming. The pause may be just a temporary change in the sun spots. I think it was when I was a child I looked at pictures with my grandfather’s stereopticon. There were pictures of glaciers. There were enough then so, if memory serves, it was evident that they were shrinking. I thought at the time that this was not good, but nobody else seemed to mind. I confess I am a warming enthusiast, but less enthusiastic about greenhouse gases. If there was any threat of them going anywhere near Permian levels, of course I would be a lot closer to hysterics. Greenhouse gases are the one thing we can safely tamper with, if that means reducing them. If there is a chance that will stabilize the climate, I’m on board for sure. But learned heads are full of the issue, so I suppose what can be done will be done. What has for a long time given me the jitters is the ice cap. The Arctic Ocean is melting more each summer. I think I saw recently that the loss of ice cover this year was greater than the previous record of a couple or three years ago. My current reference (Beating a Retreat ECONOMIST vol. 400 no. 9752 September 29. 2011 page 99) does not confirm this, but at least it was close. Everyone knows that the Arctic Ocean is melting and at some point will be essentially ice free in the late summer. Where I have differed is that I think: 1) It’s going to happen soon. 2) One of the causes is soot brought up from the temperate zone. 3) By the time it happens, there is going to be an enormous and unpredictable change in the climate. On the time scale, mostly I had been hearing, “By the end of the century.” But now it appears that while the area that is lost each year is increasing just now at a fairly leisurely pace, the volume of ice lost is rapid. In fact the volume of ice, difficult to measure and thus somewhat uncertain, has fallen by half in about thirty years. The current guess is that the rest will be gone in another forty years or only ten if it accelerates. The loss appears to be due less to surface melting than to melting from warm currents beneath the ice. Were it surface melting, I would say that the acceleration is a done deal. As more water is exposed, more heat is absorbed, since ice reflects 90% of sunlight while water absorbs 90%. But what is going on underneath there is unknown to me or anybody else. The models of the professionals cannot account for it. As far as the soot goes, that is now taken into account, but is less important than I had thought because it only contributes to surface melting. Still, they think that we might win an extra decade or two by reducing soot soon. No more fires in the fire place, alas. I thought China was the principle source of soot; they burn a lot of coal. 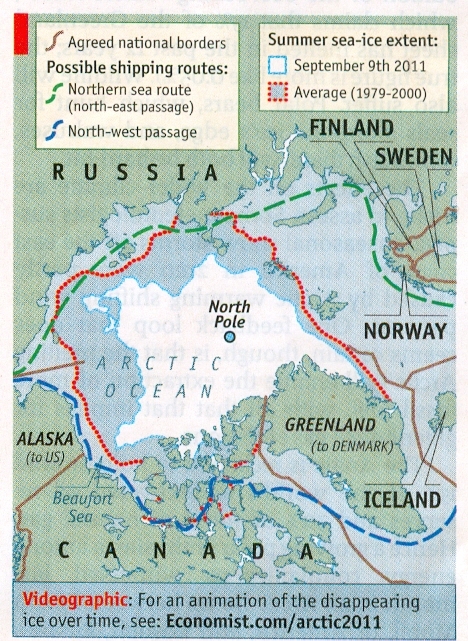 But apparently the only interest is in countries actually bordering on the Arctic Ocean and the United States. It has cheerfully been suggested that the rate of warming could be cut in half in fifty years. I am not exactly sure how that will help since the ice will probably be gone in forty. The article suggests that “a certain amount of nervousness” is appropriate. So far so good. The real issue is what happens as the ice goes. It will be bad for male polar bears. They go out onto the ice to hunt adult seals. The females and babies stay at home where the females hunt baby seals and their mothers. Getting the big males out of the way reduces pressure on that food source. Something might work out. A male can sire a lot of babies, so their loss would be grievous but if a few survive, not catastrophic. All agree that floating ice does not raise sea levels when it melts. The new ocean surface will absorb more heat and contribute to warning. That is the first time I have seen that mentioned although I have long thought it. There is oil to be tapped once the ice is gone, which I suppose is on the plus side. But what about climate patterns? Not to repeat myself, but once that ocean is bare to the sun, more energy will be absorbed at the North Pole in the late summer than anywhere else on earth. That heat is going to have a strong compulsion to go to where it is cold. That is the definition of energy; the inner urge. The coldest place will be the south pole. So we can expect to see a hot wet air mass powering its way past coriolis effects and mountain ranges to reach its cold sink. It might not be too tactful about it. When I run numbers in my head I get pumpkin sized hailstone, glaciers building in hours and supersonic winds. Let’s hope that’s just a side effect of indigestion. Well maybe it will amount to nothing more than really heavy unseasonal snow storms off the east coast. One can but hope. My only suggestion in the past has been the soot issue, and that is now being taken seriously. Looking at the map, however, one other thing does come to mind. The ice appears to be jammed up against Greenland and northern Canada. It is probably held their by those underlying currents we don’t know enough about, and there it may stay for as long as there is ice. And thither it may return when the ice has its annual winter renewal. But I wonder. Maybe, before the ice is gone, it will break off from its land base and wander. Were currents no issue, it would move under the influence of the wind. And if the water near Russia is hot, with rising air, and the ice against Canada cold with falling air, the wind will push the great raft in the direction of Russia. Of course that would reverse the temperature gradients, so it should veer off in another direction. So much for drilling the Arctic with that monster lumbering about. It might crash into the land. If an ice mass is moving at say three miles an hour and has a thousand miles of more ice behind it, what is going to happen to the land that brings it to a halt? Probably not a nice place to be camping out. And what happens to the ice? Well it might pile up pretty high and deep … miles deep? And what happens to the water currents if this plug of ice winds up in some channel? That answer is pretty easy. We already don’t know what the currents are up to. All we can say is they will probably change again. There have been 27,275 visitors so far.